This week’s participant blog post comes from Yael Engel. Every week, the Yahel blog features a post from a participant on the Yahel Social Change Program. About a month ago, I began volunteering at the Matnas (community center) on Wednesdays with a group of elderly women from Gedera. These women are originally from Libya, Yemen and Morocco and came to Israel when they were very young. There are about fifteen women who regularly come to the community center during Wednesday mornings, so I have now gained about fifteen surrogate grandmothers. When I walk into the room where they meet, a conference looking room with a small kitchenette, I am warmly greeted and immediately questioned as to why I haven’t served myself some coffee or tea and taken some of the cookies that sit on plates around the table. As I serve myself the mandatory tea, the women are already at work on different projects. A small table is set up with Gin Rummy being played by a group of four women. The veteran players taught me how to play, but I have yet to become any sort of formidable opponent for them. Others are crocheting beautiful kippot, and still others are in the middle of making beautiful hand-beaded jewelry. These women are extremely talented and very motivated when it comes to learning. They have taken classes provided by the community center on different subjects, such as how to use Facebook, and now I’m working with some of the women on English vocabulary. While these activities are going on, the women talk and include me in every conversation, which has proven to be excellent practice for improving my Hebrew skills. The first day I was there, I learned the words for wedding and marriage as I was asked about my marital status. When they found out I was twenty-two, there was a small argument (based on what I understood) over whether a young woman should be married by twenty-two; one side claimed I had more time (phew!). Conversations range from families and events going on in the community to current news. After chatting, it is off to “sport” or rather aerobics, where chairs are used to help with balance when doing stretches and other aerobic exercises. After the workout, it is time for a nice lunch and the pre-“sport” discussions are reconvened. These women have not hesitated in accepting me into the fold; I was even invited over to one woman’s house for Shabbat brunch, where I enjoyed some traditional homemade Yemenite food, including kubaneh, a special type of bread. Living in Gedera, I have had the fortunate opportunity to experience different Jewish traditions and customs. 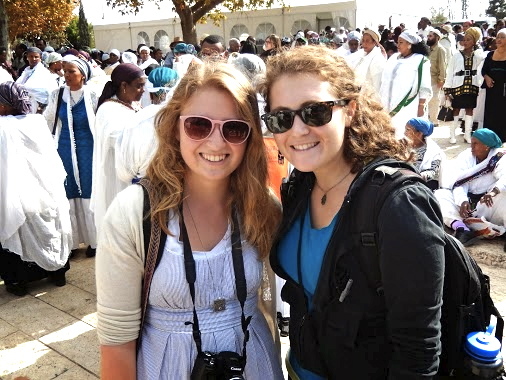 I live in a large Ethiopian community, where through both Yahel and my relationships with community members, I have had the chance to learn about different Ethiopian Jewish traditions and customs. After a learning session about Sigd, a traditional Ethiopian holiday celebrating receiving the Torah at Mount Sinai, the Yahelnikim went to Jerusalem to celebrate it. I have really appreciated the opportunity to experience different Jewish traditions and customs because it has expanded my understanding of Judaism and what it means to different people.